Are you overwhelmed with your jam-packed routine? Are you looking for a way to relieve some stress? 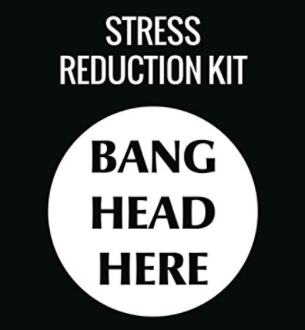 If you are nodding your head then you should definitely consider buying a the ‘Stress Reduction kit’! It comes with a funny sign which will give you and your friends something to laugh at no matter how tense the atmosphere! According to the directions, the sign should be hung against a firm surface so that you can ‘bang your head’ whenever things get a little too tough to handle. It goes without saying that you will need to be careful, don’t smash your head against the sign too many times! Remember this isn’t a movie, you will have a headache and you will need to visit a doctor! In the end, this kit can make a brilliant present for someone who is in a desperate need of a laugh. It may not be a present that you want to give a kid but it’s definitely an option if you have a colleague or friend with a really good sense of humor.